Welcome to DAD’s 2011 Impact Report. This year marks the beginning of many negative changes both nationally and locally for disabled people and carers. Proposals to reform the welfare benefits system are creating uncertainty and stress. Locally we are seeing Darlington Borough Council having to make massive savings that will lead to cut to services. Disabled people and carers will be affected both as citizens of Darlington and again as disabled people and carers, this in turn adds to more uncertainty and stress. One of the first Local Authority budget cuts was to the funding to run Darlington Association on Disability’s Shopmobility service and charging had to be introduced for the first time. Whilst I recognise that Darlington Borough Council has difficult decisions to make about spending on services I also believe there should be no cuts to disabled peoples' services. However cuts there will be and I am committed to ensuring that disabled people in Darlington are fully involved in any decisions that affect them. Unfortunately all the national and local upheaval over shadows other good results and the different projects within Darlington Association on Disability report many positive outcomes for disabled people and carers. Management, staff and volunteers have worked extremely hard to ensure Darlington Association on Disability fulfils its commitments to people. They have not only supported disabled people and carers but also each other, with many going that extra mile above and beyond as the demand on our services have grown. I am immensely grateful to them all and offer them my heartfelt thanks. I acknowledge the role played by the Chief Executive Lauren Robinson and Assistant Chief Executive Jacki Hiles and senior managers Tracy Roberts and Rosemary Berks in continuing to make Darlington Association on Disability a leading disability user led organisation and I thank them for their loyalty and dedication. I can not overstate how appreciative I am to all our financial supporters, especially in these times of uncertainty, and offer them my sincere thanks. 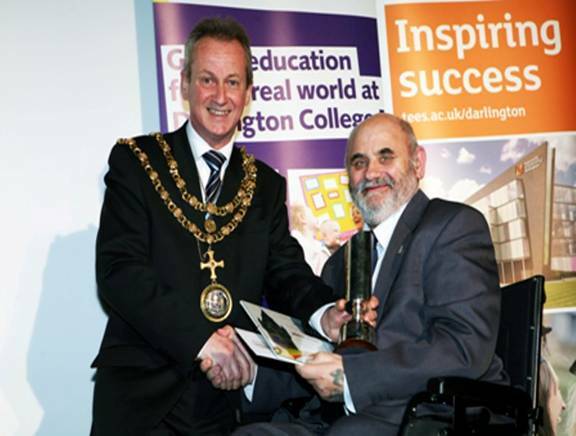 I am indebted to my fellow trustees for their support to me and their commitment to Darlington Association on Disability. I also thank them for their many hours of hands on work as volunteers within the organisation. DAD is driven by its commitment to being a User Led Organisation. What is a User Led Organisation? As a ULO DAD also responds to the needs of local disabled people and carers, and involves them in designing, delivering and monitoring its services. DAD’s Memorandum and Articles are designed to ensure that disabled people maintain control of DAD. Our membership reflects the same principle. DAD works to the Social Model of Disability, and works to remove barriers caused by Society for people with impairments. DAD has over 3000 members. Jane is 82 years old and lives alone. She has family but they all work and have busy lives. When the Direct Payments service visited it was clear that she was not getting the support she needed to get out and socialise. Jane was quite isolated. The lead worker reassured her that getting more support would not lead to an increased contribution and supported Jane to ask for some more support which was assessed. Jane is now enjoying the extra support. • Supported DAD’s work by maintaining a bank of regular volunteers to work across the organisation, and by recruiting and placing sessional volunteers for DASH play schemes. • Run a series of user involvement forums focused on the service user guidance for personal budgets and seven in-control steps. • Launched a new peer support group aimed at removing the barriers for older people to be involved in peer support and user involvement. 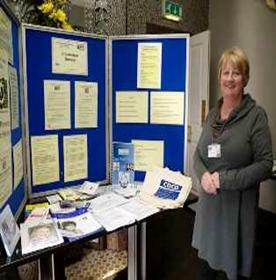 Kate’s parents were very apprehensive about leaving her with someone who was not her immediate family, but trust soon developed and her parents began to develop trust with her Personal Assistant during the three hours a week support sessions supporting Kate in their home while they went shopping etc. Attending the DASH Playscheme gave her parents the opportunity to attend appointments and spend some quality time together. This also gave Kate the opportunity to develop social skills and experience new activities. • Held a series of discussion sessions within DAD before preparing and delivering a report for disabled people and carers on Darlington Borough Council’s Fairer Contribution Policy. “The session was both valuable and informative which I feel has provided me with a solid foundation to take into my future practice, thank you.”: after personalisation training delivered to students at New College Durham. The Capacity Builders project worked with small User Led groups across Tees Valley. 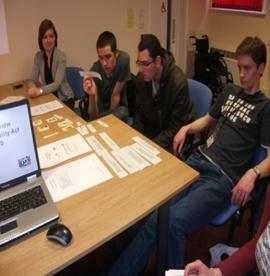 Training was delivered on support planning so that groups could support disabled people and carers in their area. • Supported an Expert by Experience to attend two national briefing days to train other experts on how to conduct thematic inspections. The following figures are taken from the Report of the Trustees and Financial Statements for the year ended 31st March 2011 for Darlington Association on Disability. Bank Interest of £192, Project Income of £845,322. Voluntary Income Grants of £73,987, Financial Assistance Funding of £16391 and Fundraising Income of £23,807. Fundraising and Governance Costs £99,334; Project Costs £798,113; Support Costs Management £31,325 and Depreciation £2,215. The Big Lottery, Children in Need, Darlington Borough Council, Durham County Council, Darlington Primary Care Trust, Department for Education, The Home Office, Aiming High for Disabled Children, Scope, Parent Forum, Coleridge Centre, Capacity Builders, Sunderland University, Equality and Human Rights Commission, Tees Valley YMCA, Changemakers, Future Jobs Fund, and The Alliance for Inclusive Education - ALLFIE. • Direct Payment Support Service: Support for disabled people to take control of their care needs by managing a payment from the local authority, including managed accounts.